Gavin Thompson stands out from the flock. 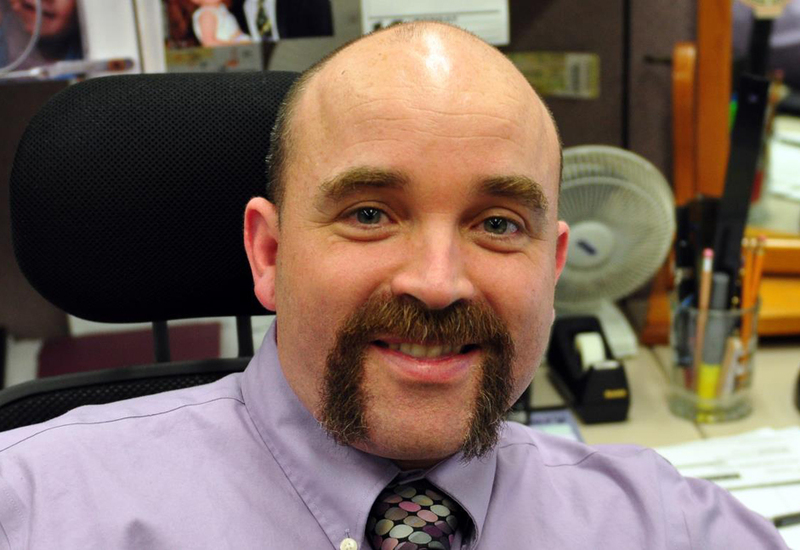 There’s his shaved head, handlebar moustache, trademark grin (the infectious kind that spreads easily to everyone around him), and peerless style and flair. But it’s more than that. He carries an energy that attracts others to him, bringing out their best qualities and emboldening them to take on new challenges. I’ve known Gavin for about 20 years, since I started playing on his co-ed ultimate team, the Fabulous Flying Flamingoes. He has been one of the most important people in my life—someone who brought about pivotal change for me and had a powerful, lasting influence. But I’m not even sure he’s aware of his impact. His exuberance, positivity and generosity extend to so many people; I don’t know how he could ever fully appreciate how many lives he has improved, how many hearts he’s touched. In the past few months, Gavin’s capacity to help others has grown considerably. 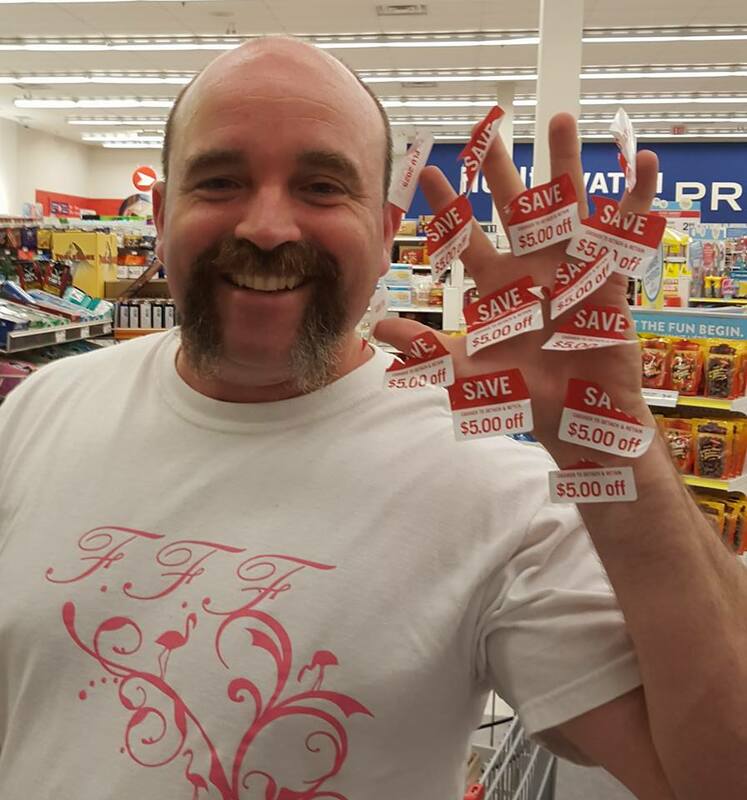 His penchant for finding great deals (he’s been called an “extreme bargain hunter”) led to Boom! Savings! Charity Shopping Club, which was launched in early 2016 to formalize Gavin’s efforts to capitalize on clearance sales and corporate points systems to buy goods for various local charities. 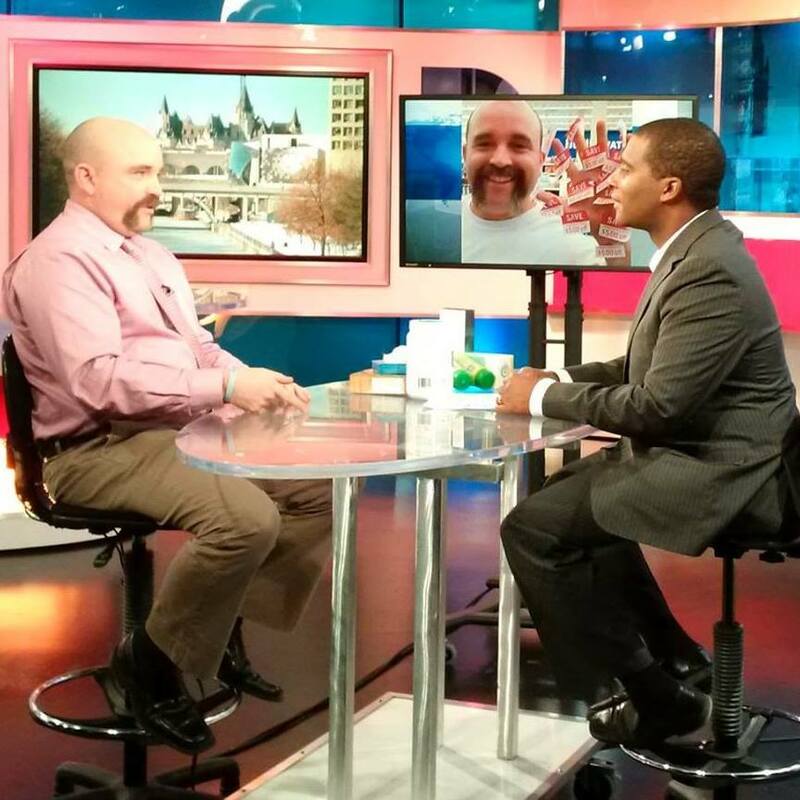 The club has gotten a fair amount of press this year, including from CBC’s Ottawa Morning and Our Ottawa. It’s wonderful to see his charity work receive such great attention. But here’s the thing: As amazing as Boom! Savings! 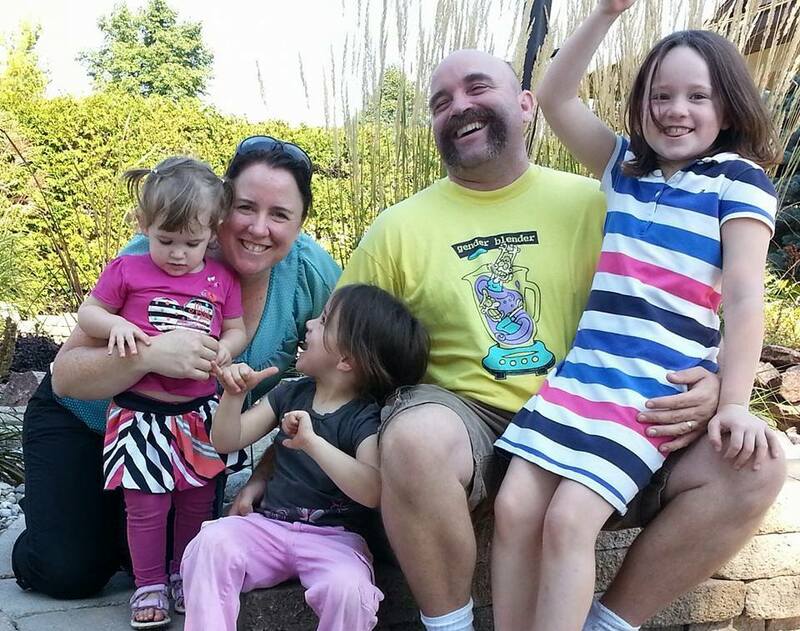 is, there’s so much more to Gavin’s story, so many more tales of generosity and ingenuity. 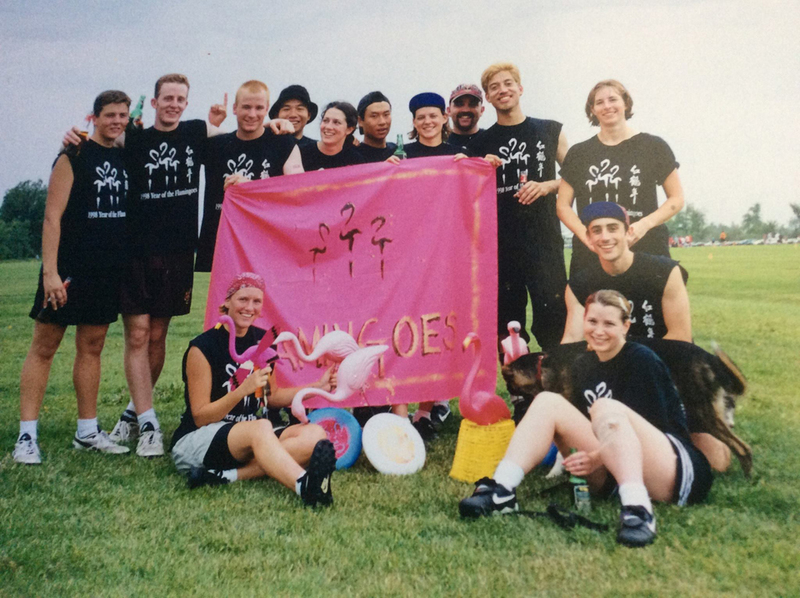 That began to change when he and his Glebe Collegiate Institute classmates formed the Fabulous Flying Flamingoes (FFF), a recreational ultimate team. They launched FFF in 1990, and Gavin has played with them every year since. 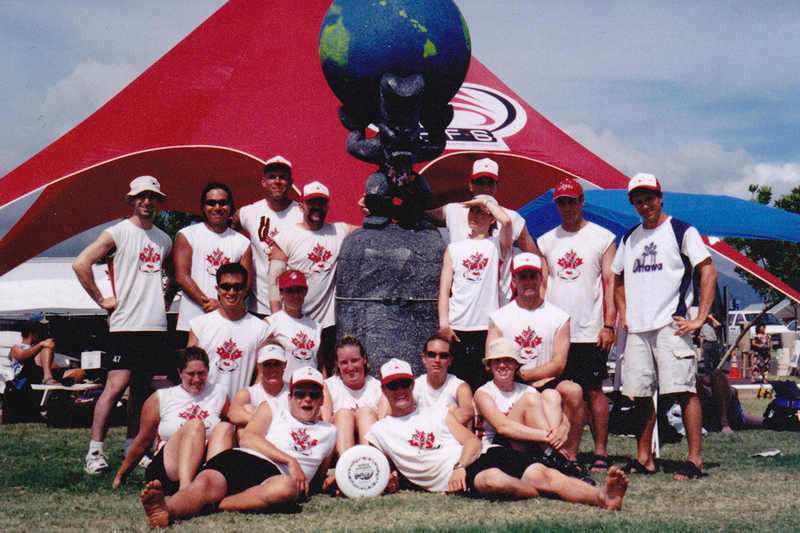 Under his leadership, it evolved into a co-ed touring team for several years, earning a spot at the 2002 World Ultimate Club Championships in Hawaii before returning to its grassroots on the Ottawa Carleton Ultimate Association’s league fields. As his doubts subsided, Gavin went from being “a typical student who lived in a small bubble” to someone with a burgeoning sense of self who wanted to learn more about who he was, and wasn’t afraid to let others in on the secret. “Once I developed self-confidence, it allowed me to become more expressive as a person,” he says. Among the facets he began exploring further was his desire to give back to the community. He’d always had a yearning to help others, but “hadn’t really found the right avenue for it,” he says. So he started looking into how he could make a difference in a way that felt right. One of his initiatives came through FFF, when he introduced Sharing Through Scoring in the early 2000s. “At every league game, my team would pledge to donate a dollar per point scored, and we’d ask our opponents to do the same,” he says. With the money raised, FFF made donations to the Wild Bird Care Centre, Make-A-Wish Foundation and Ottawa Food Bank. Sharing Through Scoring was a great program in and of itself. It also allowed the Flamingo to wade in and gobble up a taste of what was to come. Gavin (back row, third from right) and Karlis (back row, second from right) with the Fabulous Flying Flamingoes league team, Ottawa, Ont. But that doesn’t mean Gavin hasn’t had other sporting relationships. In addition to being a hockey mentor during university, he began working as a statistician for the Gee-Gees men’s and women’s basketball teams, something he still does today. 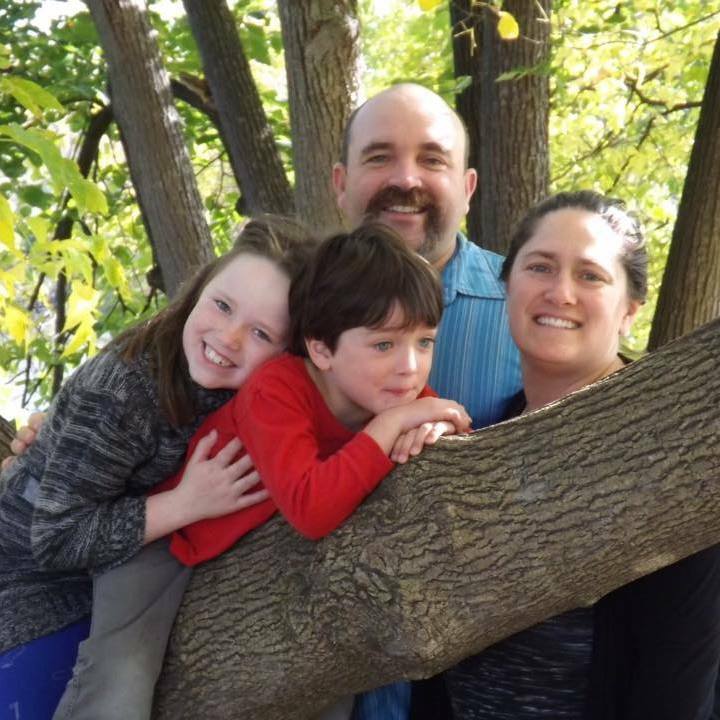 After completing his undergraduate degree in 1997, Gavin stayed at uOttawa to pursue a Masters in Biostatistics, which he finished in 2000. He’s been working as a methodologist at Statistics Canada ever since. Through his intense involvement in athletics, he has repeatedly proven that having a logical, math-oriented mind helps in (and on) more fields than just math. He seems to have an innate gift for spotting patterns. I’ve seen him take mental snapshots of a game in progress and instantly be able to identify the plays. 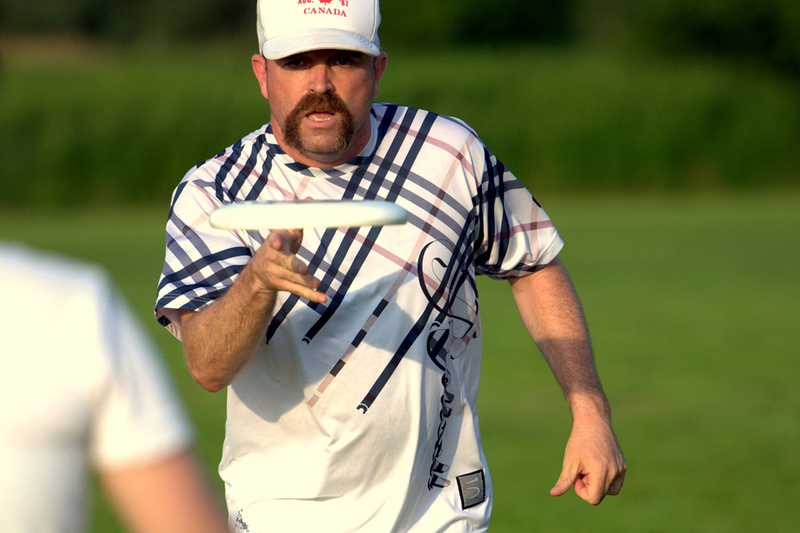 That ability has benefited many ultimate players across Canada (although it may have irked some of his opponents). 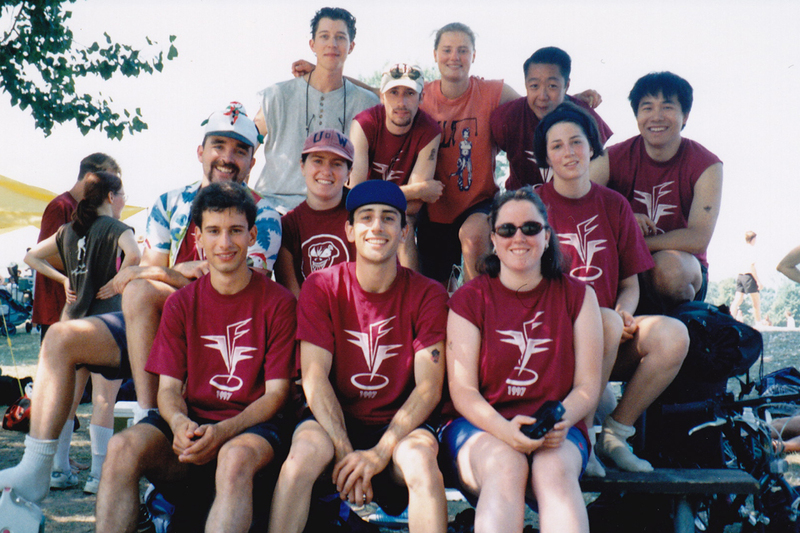 In 2004, Gavin left Ottawa’s top co-ed team (Silver, a merger between FFF and their former rivals) and began playing with only B teams so he could help nurture new talent. 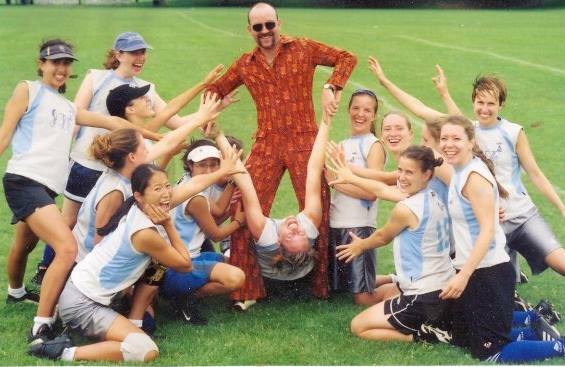 He founded and coached Ottawa’s developmental co-ed team, Bigfish, and later began coaching the women’s team Stella B. He stayed with Wreckhouse until 2011, when they’d developed the skills and knowledge necessary to lead the team on their own. 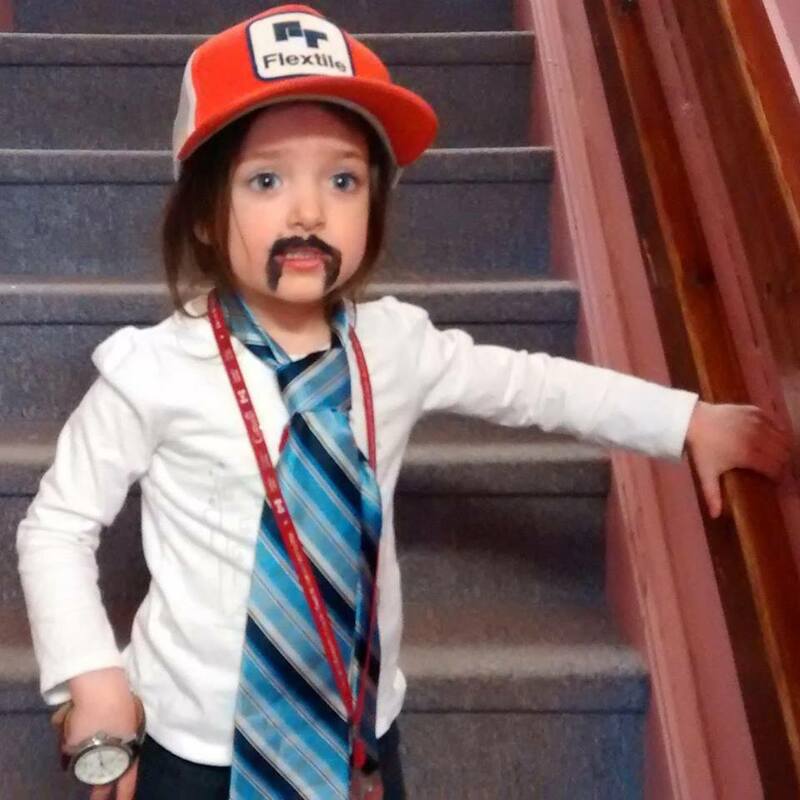 In those three years, he travelled to every Wreckhouse tournament, and frequently brought his family—Terry, whom he married in 2007, and Maddie—to Newfoundland to help mentor and run clinics for local players. Since leaving Wreckhouse to their own devices, his passion for ultimate hasn’t waned a bit. He played with the Ottawa masters team Iron Crow for the past two seasons, and will continue to coach Stella B in summer 2016. He’s also still a keen league player; this year marks his 27th consecutive season playing with FFF. Gavin (middle, left) at the Britannia Beach Tournament, Ottawa, Ont. Gavin has so many passions and pastimes, from Scrabble to poker to photography, and he tackles them all with incredible enthusiasm. He only got serious about photography a few years ago, but he’s already racked up some impressive credits. He shot the 2013 Under-23 Ultimate Championships in Toronto, Ontario and is applying to be an official photographer at the World Ultimate and Guts Championships in London, England this summer. The reasons behind his new pursuits are often—in fact, usually—selfless. “My entire raison d’etre, when it comes to ultimate photography, is getting pictures to the people I’ve taken them of so they can enjoy them,” he says. As long as I’ve known Gavin, he’s had his priorities firmly in place. 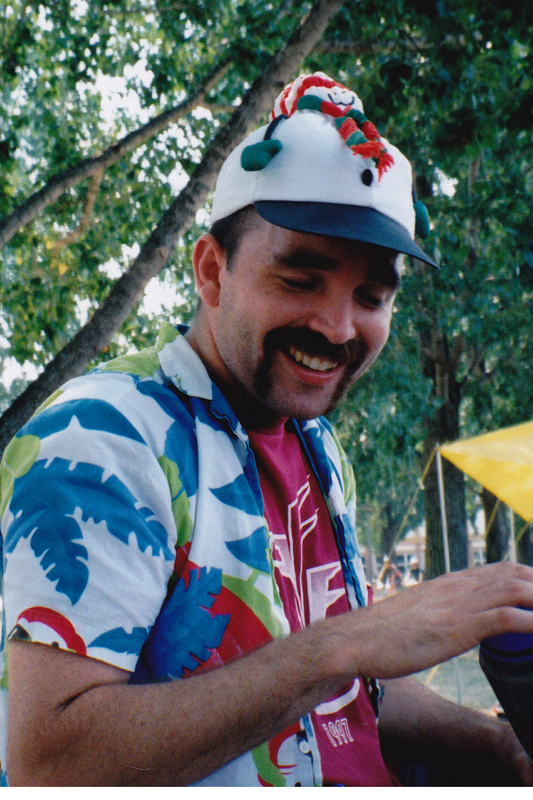 While I played ultimate with FFF, he worked four days at week at Statistics Canada, instead of five. His rationale was that if he worked full-time, he just ended up buying more stuff, so he’d rather make a bit less and have the extra day for ultimate, friends and family. Not long before becoming a father, he returned to working full-time in 2007. But he still makes time for what matters most to him. Which makes me wonder how he’s able to fit in everything that he does. “I don’t watch TV and I don’t watch movies and I don’t read fiction,” he says. As he sees it, nearly all of it is about selling products and attracting the most viewers or readers. “It’s not about telling the story they want to tell; it’s about telling the story that generates the most revenue.” And he doesn’t want to feed that system. Given his strong stance against the machine, it’s no surprise that Gavin is more than the willing to forfeit the 10 to 15 hours he says most North American adults spending watching TV each week, and spend it instead doing something much more valuable. Even if does involve putting more money in corporate pockets. Gavin has always loved seeking out good deals. But it wasn’t until last year that he ratcheted things up to a new level. In January 2015, he created the blog frugalitiness: The art of being frugal, deepening his quest to make ever-more impressive savings. His friends took note, and by the end of the year, he was issued a challenge: Accept $150 and see how far he could make it go for charity. Turns out, he can huck it pretty far. He used that $150 to purchase—and donate—$1535.49 of goods (a return of 10.24 times the investment, he’s happy to point out). Since then, Gavin has resoundingly shattered expectations. Officially dubbed Boom! Savings! Charity Shopping Club in January 2016, his initiative has contributed goods to a large and growing list of Ottawa-area charities, including: Britannia Woods Food Pantry, Capital Welcomes, Daisy’s Drop In, Gloucester Emergency Food Cupboard, Harmony House, Norman Johnston Food Cupboard, Operation Come Home, Parkdale Food Centre, The Snowsuit Fund, St. Joe’s Women’s Centre, The Tampon Project, Tampon Tuesday and Youville Centre. Here’s how it works: Gavin monitors stores loyalty programs to make use of the points system. He also gets down on the ground level, regularly marching through stores to look for clearance sales that aren’t advertised online or in flyers. 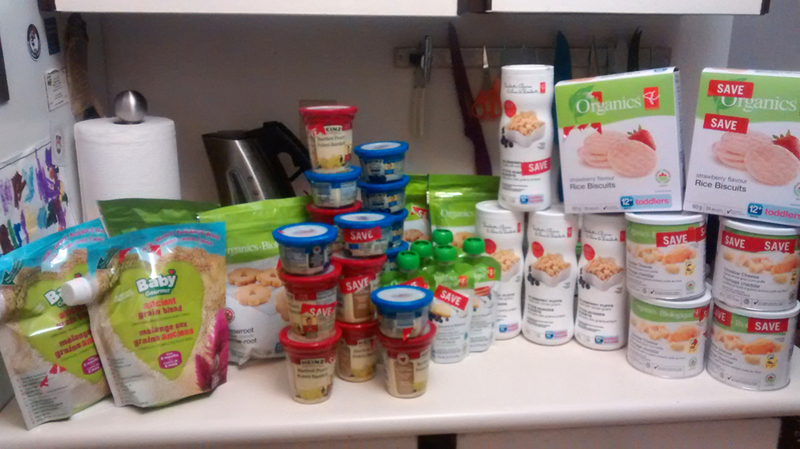 By combining those two methods, he’s able to get astounding deals; he once saved more than $2,300 on a purchase of $201.79, and paid $1.80 for more than $90 worth of baby food. Some of the charities he donates to focus on supporting young mothers and women. 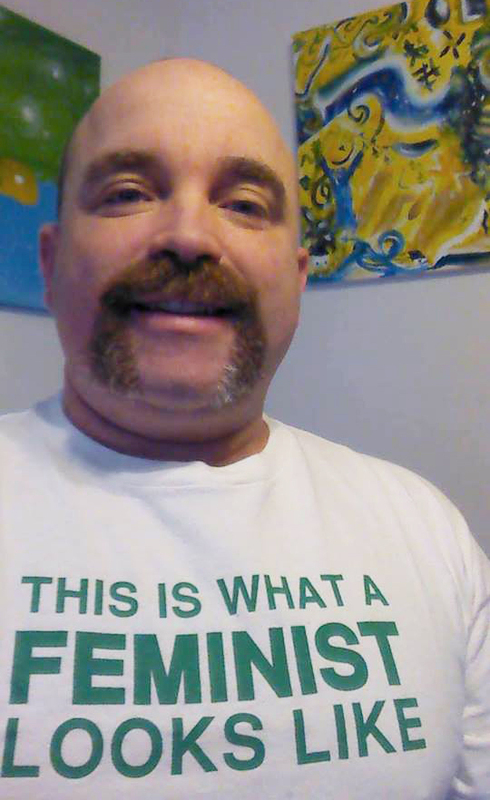 His work with those organizations, among other things, has him further exploring the idea of what it means to be a feminist. A gifted statistician, Gavin is excited by the numbers game of discount charity shopping. For him, much of the drive to give back comes from economies of scale. Math is a huge part of his equation. But the real engine behind his metrics isn’t a calculator, it’s a compass: Gavin’s huge, powerful heart. It’s one that continues to expand exponentially. “The more I work with charities, the more I see the human element,” he says. Here’s how he sees it: If someone with money is willing to spend money on something, there exists a person without money who would like to have it, too. This February, he bought hair dye on sale and donated it to Daisy’s Drop-In, Harmony House, St. Joe’s Women’s Centre and Youville Centre. He was enlightened by the positive response. Gavin is very proud of his family’s support of his charity work. Terry, a teacher at Hawthorne Public School, has long been spending her own money to provide supplies for students in need. So she’s well aware of the importance of giving to others. And she easily recognizes how important Boom! Savings! has become. This winter, Maddie and Sammie spent three hours matching shoes when Gavin donated them to Capital Welcomes for the hundreds of Syrian refugees arriving in Ottawa. “The kids understand that there are people out there who have a lot less than we have and that they need help,” he says. Gavin takes each product donation to heart. He’s seen firsthand that every time someone picks up an item from one of the charities, there’s a story behind it. “It’s the stories of abuse, it’s the stories of addiction, it’s the stories of ending up in a situation that any one of us could have ended up in,” he says. “I think all of us are one mistake away from ending up in a really dire place. You look at people who have addiction issues—some went to one party and they tried the wrong drug once, and that was it; it was over. Ultimately, he wants companies to stop generating so much waste and start finding ways of channeling it to people in need. He recognizes that most businesses won’t make it happen of their own accord. “Their job is to make money, not be charitable,” he says. “So it will take a large social movement, or the government, to either force or incentivize businesses into giving rather than wasting.” But that doesn’t mean we should sit idle. Until it becomes the norm for companies to cut back on waste, he hopes to see other cities form clubs like Boom! Savings! Wise words from a rare bird. 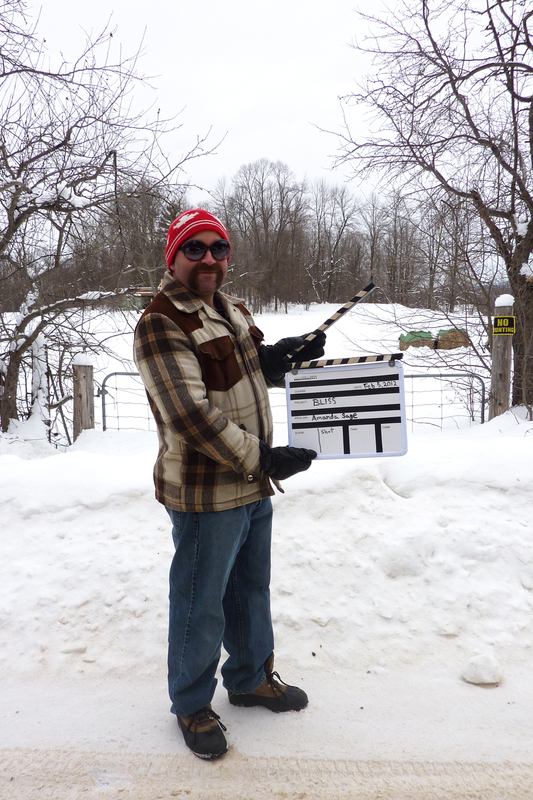 For the latest on Gavin, email gavinthompson@rogers.com and follow his frugalitiness blog. To follow his charity shopping adventures, join the Boom! Savings! Facebook group and follow @Savings4Charity on Twitter. To donate to the club, please send e-transfers to boomsavingscharity@gmail.com. I loved the glowing review of Gavin in this article! He truly is this amazing positive force who brings out the best in those around him. Not to mention he is tons of fun! This Boom! Savings! project is an impressive way to support those in need while fighting the evil spirit of capitalism. Gavin, you are DA BOMB! Thanks, Margaret! You and Gavin are two of the most social, welcoming people I know. 🙂 Love your apt review of him, too!